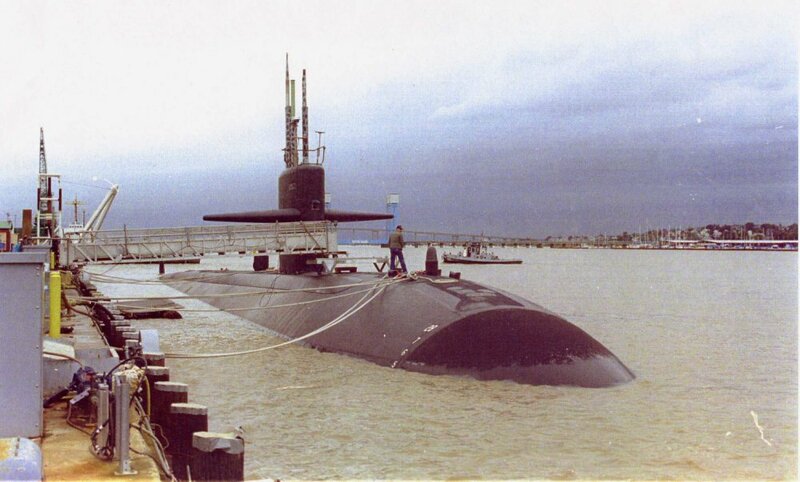 Los Angeles Class Attack Submarine: Laid down, 8 January 1972, at Newport News Shipbuilding and Dry Dock, Co., Newport News, VA.; Launched, 6 April 1974; Commissioned, USS Los Angeles (SSN-688), 13 November 1976. 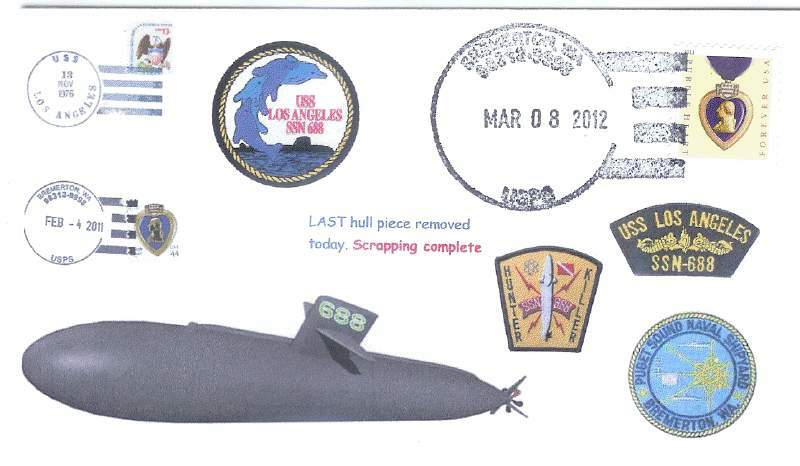 Los Angeles was decommissioned 23 January 2010 and finished IRR on 8 March 2012 at Puget Sound Naval Shipyard in Bremerton, Wash.
47k The ring shaped hull section of Cincinnati (SSN-693) and the hull of Los Angeles (SSN-688) on the ways prior to the twin keel laying and launching ceremony on 6 April 1974. Clipping provided by Mike Hogan. 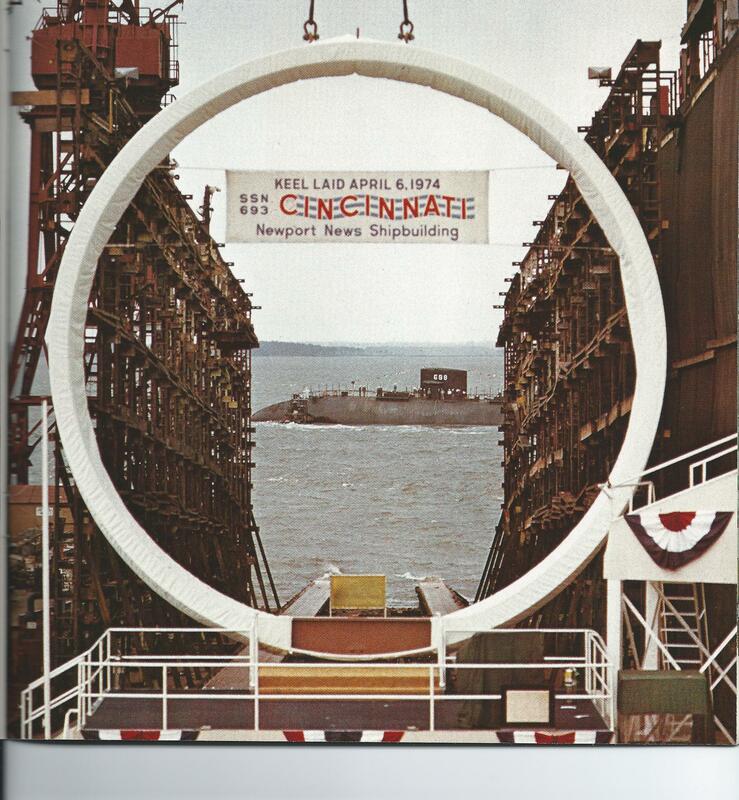 Photo courtesy Tenneco Magazine, text courtesy of la-ex.org. & submitted by Bill Gonyo. 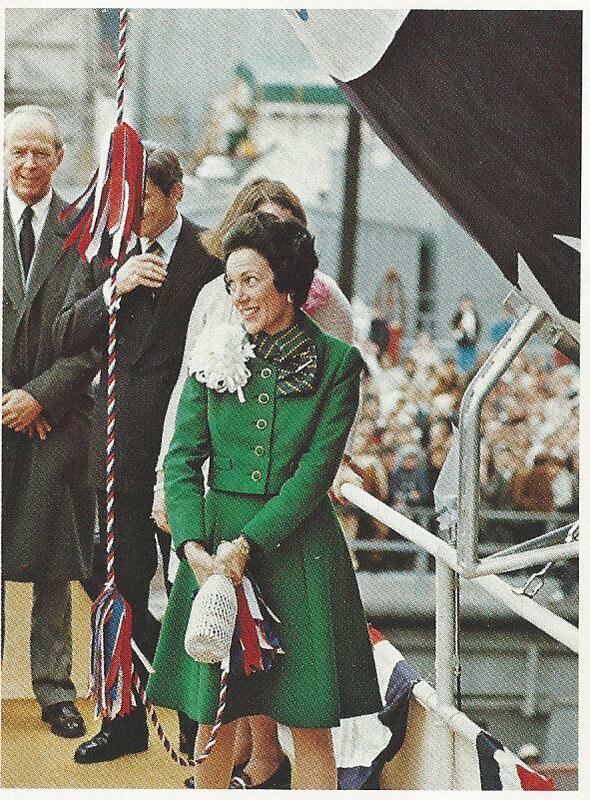 348k Mrs. Anne Armstrong, Counsellor to the President was chosen as the sponsor of the Los Angeles (SSN-688). 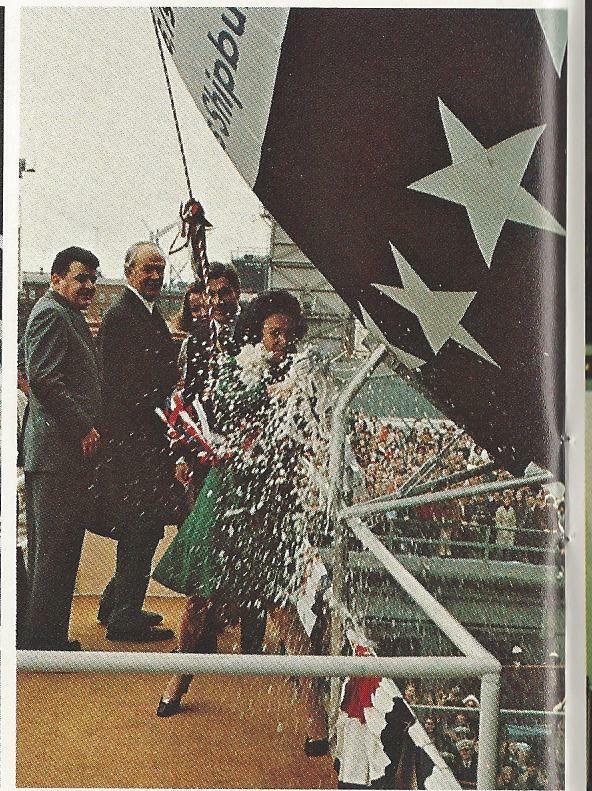 As the sponsor, Mrs. Armstrong was asked to christen the ship using the traditional bottle of Champagne. She had just a little difficulty with that task. Mrs. Armstrong tried over a dozen swings in an attempt to break the bottle and splash champagne on the bow of Los Angeles. It took a second, a spare, bottle to do the trick. "The second bottle was to christen the Los Angeles: the first bottle was to show that the ship and her crew are staunch and strong and unyielding." USN photo & text courtesy of la-ex.org. & submitted by Bill Gonyo & Dale Hargrave. 903k Los Angeles (SSN-688) slides down the ways. Photo courtesy of Dale Hargrave. 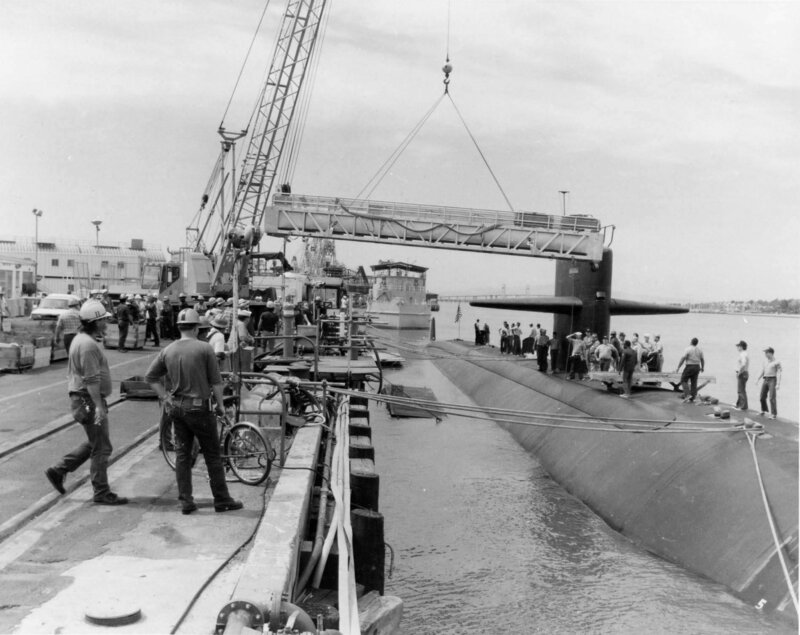 792k Ringed by the keel laying flag of the Cincinnati (SSN-693), tugs nudge the Los Angeles (SSN-688) dockside after her launching. Photo courtesy of Dale Hargrave. 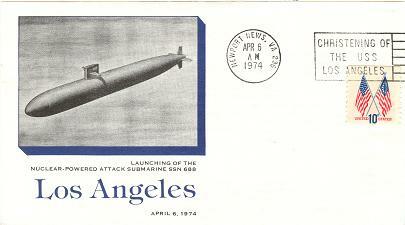 15k Commemorative postal cover issued on the occasion of the launching of the Los Angeles (SSN-688), 6 April 1974. Courtesy of Jack Treutle (of blessed memory). 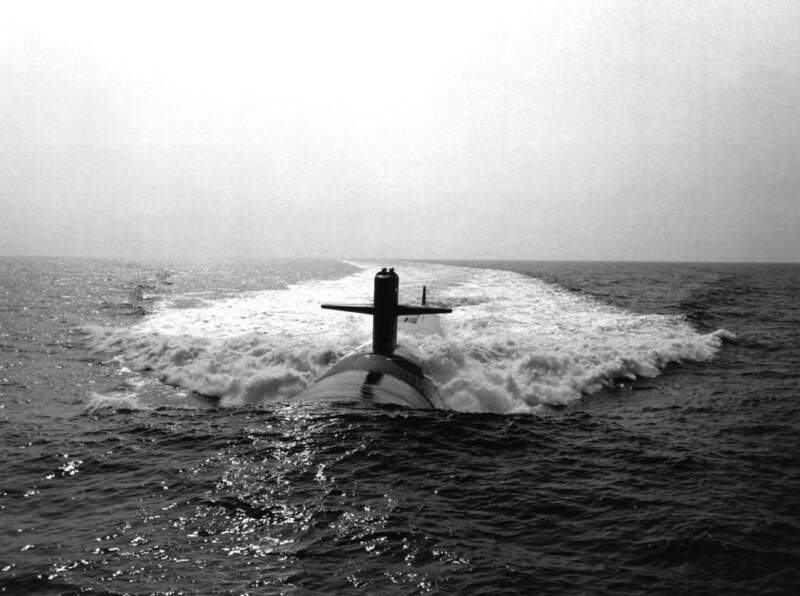 355k Los Angeles (SSN-688) underway, probably during her alpha sea trials off the Atlantic coast, summer 1976. USN photo submitted by Fabio Peña, courtesy of the Com Sub Group Nine. 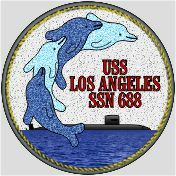 2.54k Welcome Aboard Los Angeles (SSN-688). USN photo courtesy of Scott Koen & ussnewyork.com. 747k Overheard view of the Los Angeles (SSN-688) in the Atlantic Ocean on 28 April 1977. Vallejo Naval and Historical Museum photo courtesy of Darryl L. Baker. 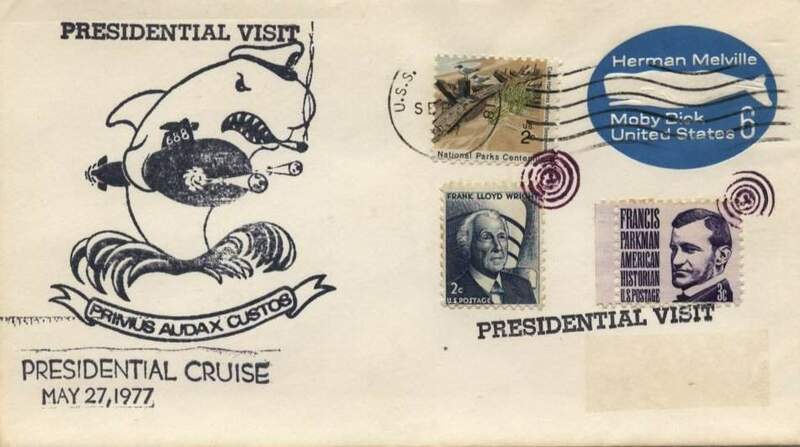 58k Commemorative postal cover issued on the occasion of a Presidential visit & cruise of the Los Angeles (SSN-688), 27 May 1977. Courtesy of Jack Treutle (of blessed memory). 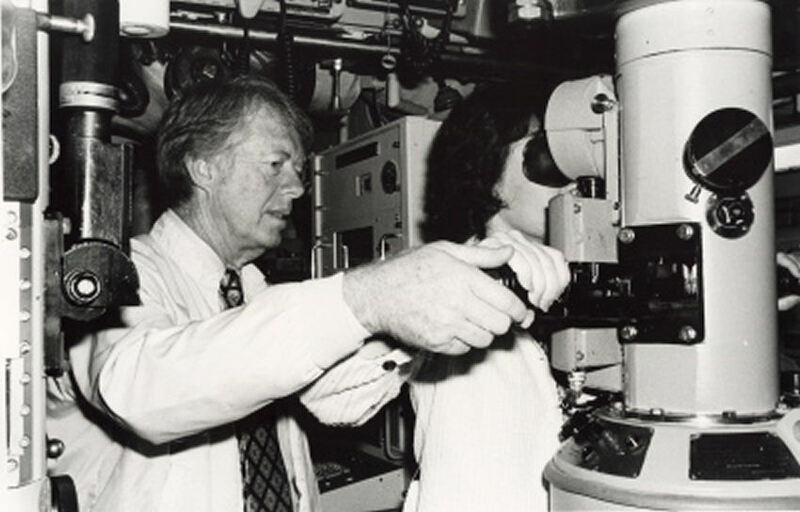 75k The First Lady peers through a periscope of Los Angeles (SSN-688),with tips of what to look for from her husband, President Jimmy Carter, at Cape Canaveral, Florida, 27 May 1977. USNI photo. 116k A port bow view of the nuclear-powered attack submarine Los Angeles (SSN-688) underway on 1 December 1982. Photo # NN-33300514 by Newport News & Shipbuilding, in the National Archives & Records Administration (NARA). Also referenced as # DN-SN-83-02657 from the Department of Defense Still Media Collection, courtesy of dodmedia.osd.mil.⊂mitted by Bill Gonyo. 709k Los Angeles (SSN-688) arrives at Mare Island on 6 August 1992 for overhaul and refueling. The tug Skenandoa (YTB-835) ready to assist in her berthing at the shipyard. USN photo courtesy of Darryl L. Baker. 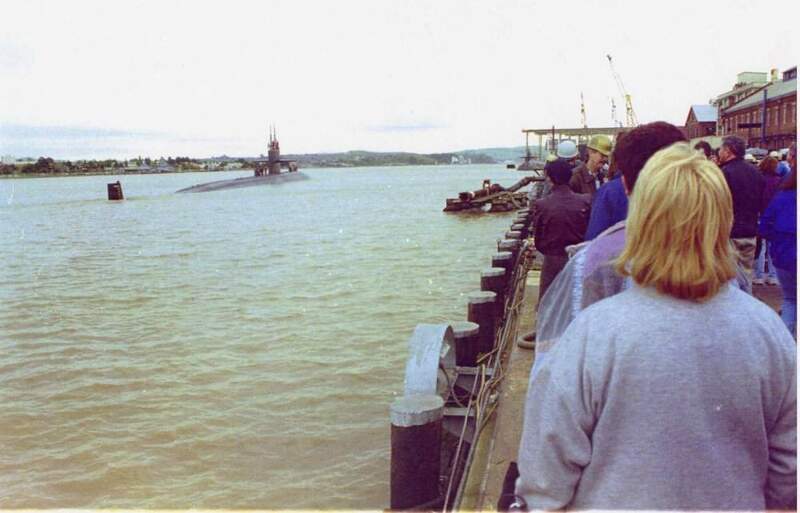 232k The Los Angeles (SSN-688) arrives at Mare Island Naval Shipyard in August 1992. She under went a refueling overhaul at the yard from 1 October 1992 to 10 March 1995. USN photo courtesy of Darryl L. Baker. 276k Los Angeles (SSN-688) is shown in the early morning of 10 March 1995 prior to her departure from Mare Island after her overhaul. USN photo courtesy of Darryl L. Baker. 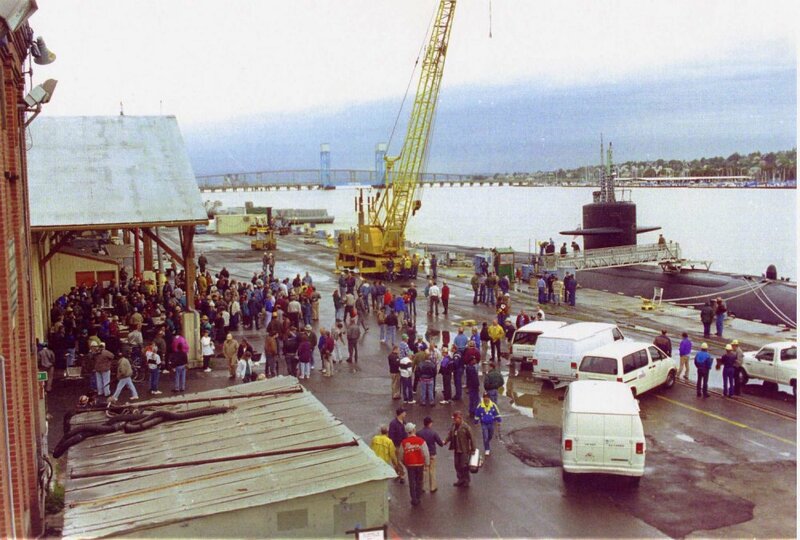 189k A crowd has gathered along side the Los Angeles (SSN-688) to mark the completion of her overhaul at Mare Island on 10 March 1995. USN photo courtesy of Darryl L. Baker. 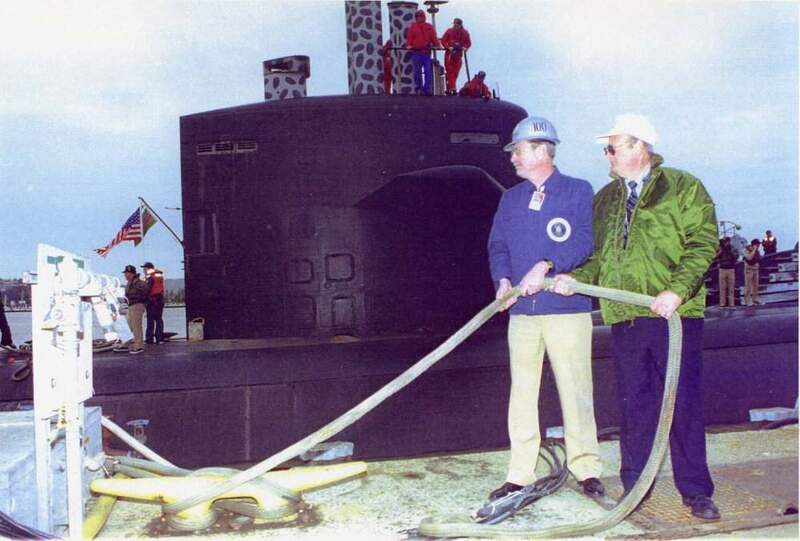 74k Capt John B. Cavender, Commander Mare Island Naval Shipyard and Paul Tipton, Project Manager for Los Angeles (SSN-688) are shown casting off the last line of the last overhaul at now closed shipyard on 10 March 1995. USN photo courtesy of Darryl L. Baker. 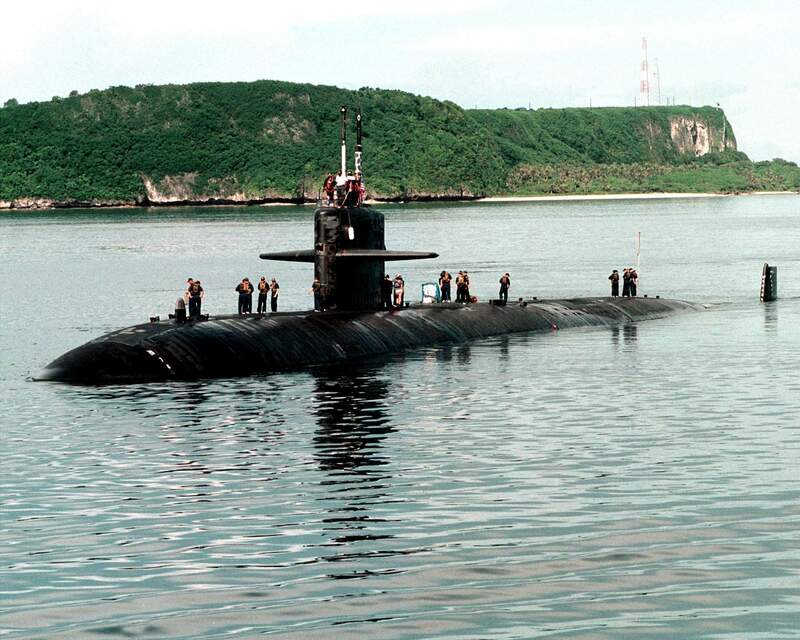 60k Los Angeles (SSN-688) is shown departing Mare Island on 10 March 1995 are completing an overhaul. The decommissioned Baton Rouge (SSN-689) is seen on the far right. USN photo courtesy of Darryl L. Baker. 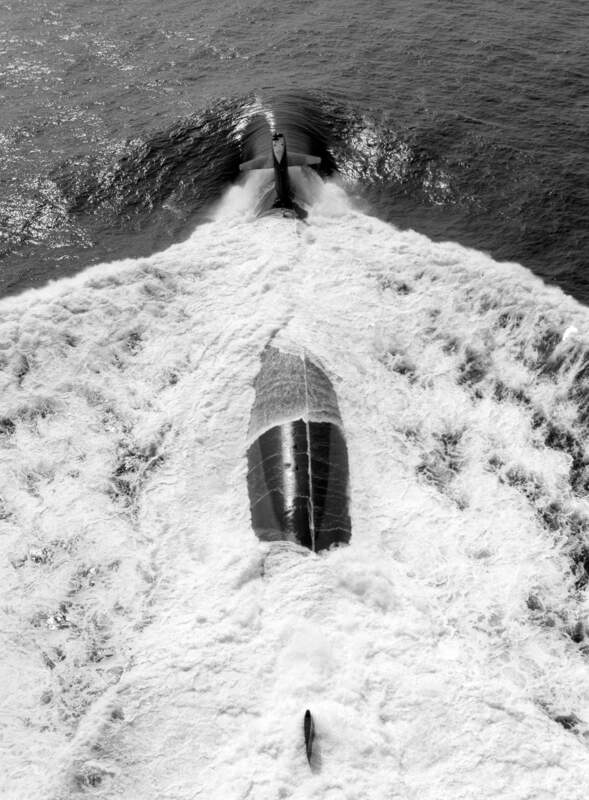 148k Broadside view of the Los Angeles (SSN-688) on a training maneuver off the coast of Singapore. USN photo and caption by PH1(AW/SW) Kevin H. Tierney, courtesy of csp.navy.mil., submitted by Bill Gonyo. 276k Powering along and forming a boiling wake, the Los Angeles (SSN-688) completes a training maneuver off the coast of Singapore. USN photo and caption by PH1(AW/SW) Kevin H. Tierney, courtesy of csp.navy.mil., submitted by Bill Gonyo. 388k Captain Christopher B. Thomas received his commission in 1984 from Miami University with a Bachelor of Science degree in Physics. Following graduation, he reported to the Navy Staff in Washington D.C. where he worked in the SSN 688 procurement program until reporting to Nuclear Power School in Orlando, Florida. 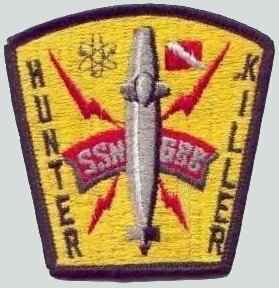 Completing the Nuclear Power Training, and Submarine School, he reported to Oklahoma City (SSN-723) in February 1986 where he served as Reactor Control Assistant, and Main Propulsion Assistant. In July 1989, Captain Thomas reported to Naval Postgraduate School where he earned a degree of Master of Science specializing in Plasma Physics. 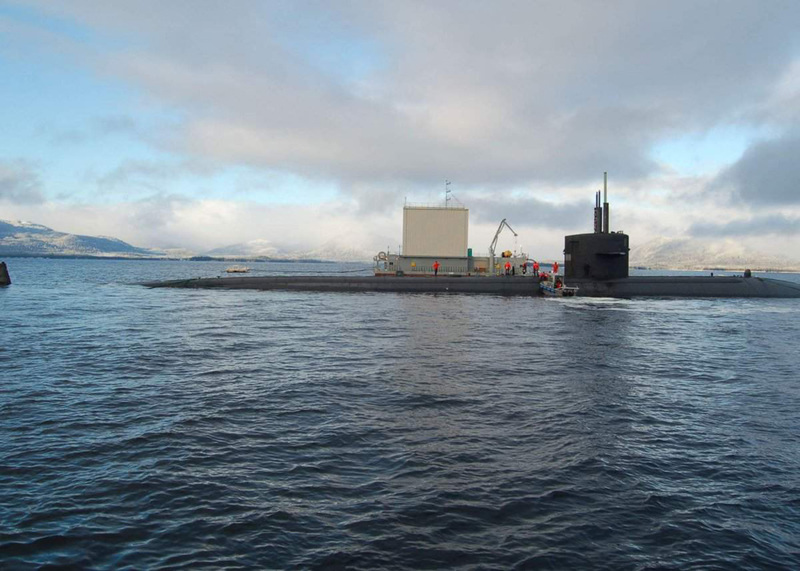 Following Department Head School in Groton, Connecticut, he served as Engineer Officer in Pargo (SSN-650) from July 1992 to May 1995, where he conducted two arctic deployments and one northern Atlantic deployment before decommissioning the ship in Bremerton, Washington. Following defueling of Pargo, Captain Thomas assumed the duties of Executive Officer until completion of the ship's inactivation. In June 1995, Captain Thomas reported to Defense Special Weapons Agency where he managed programs for advanced air defense architectures and theater missile defense systems focusing on defense of the Korean Peninsula, and NATO's southern flank. 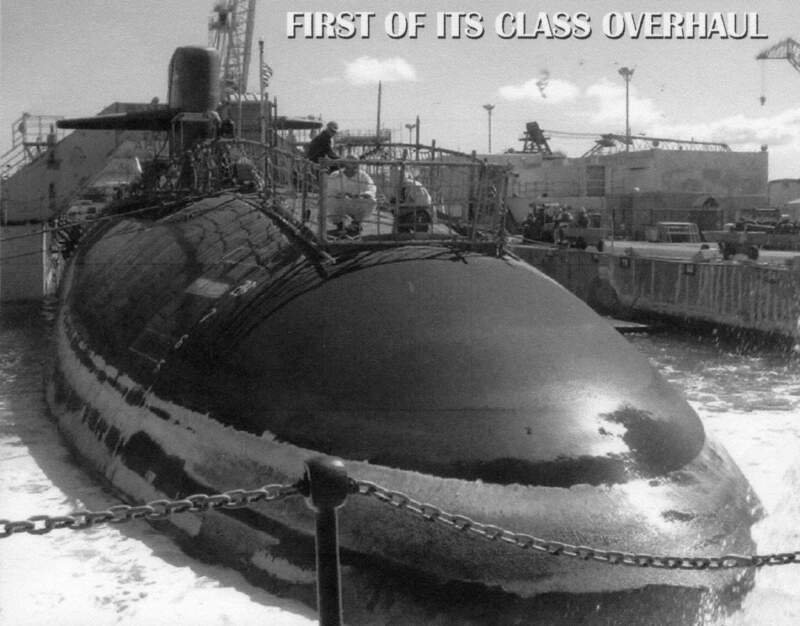 After completing the Executive Officer training program, he reported to Kamehameha (SSN-642) in June 1997. 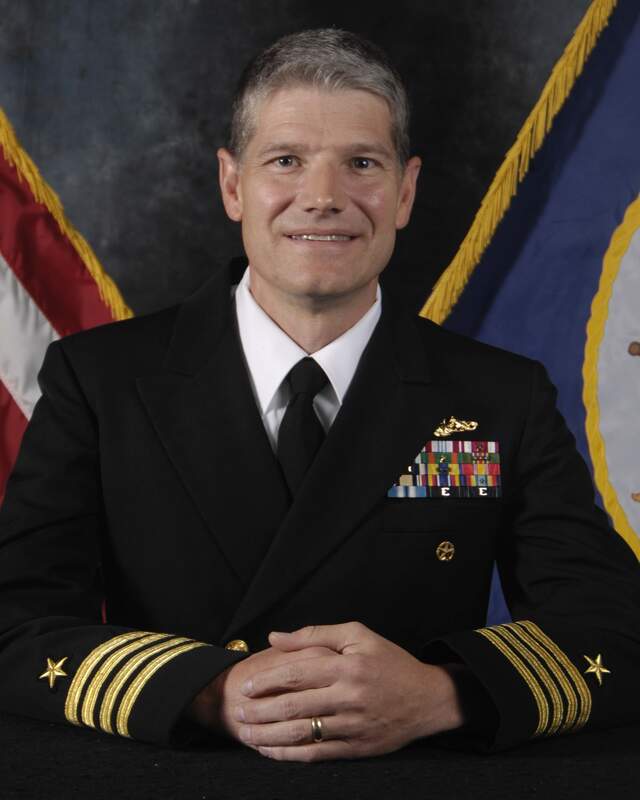 During his tour as Executive Officer, he made three western pacific deployments in support of Naval Special Warfare, and the ship received the BATTLE EFFICIENCY award. 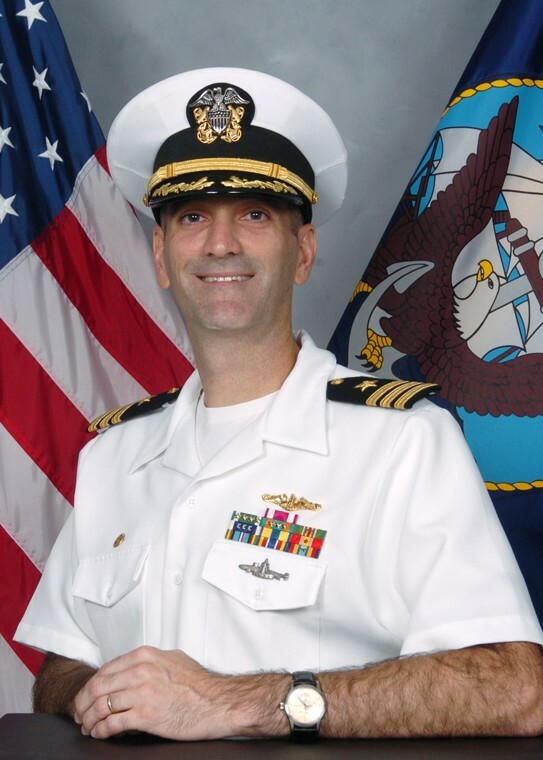 Following Prospective Commanding Officer training, Captain Thomas reported for assignment as Deputy for Operations for Submarine Squadron One in March 2000. 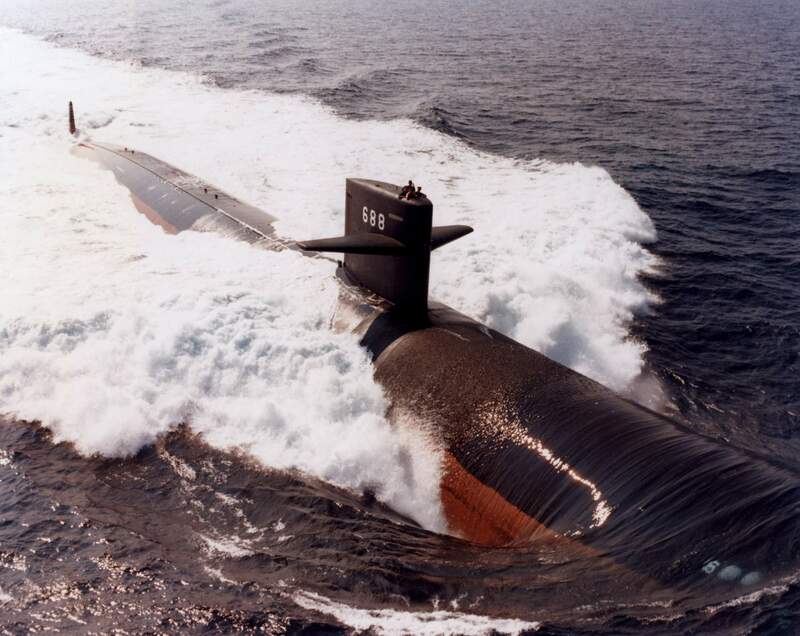 In August 2000, Captain Thomas assumed command of Los Angeles (SSN-688) and completed two western pacific deployments, one in support of Naval Special Warfare, conducted five missions vital to national security, and was awarded the BATTLE EFFICIENCY award for 2003 and Meritorious Unit Commendation. In October 2003, he reported to Commander, Carrier Strike Group TEN as the Assistant Chief of Staff for C4I where he completed a deployment in support of Operation Iraqi Freedom and the Global War on Terrorism. From 2005 to 2008 he served on Commander Submarine Force staff as the Submarine Operations Officer for CTG 20.3 and CTF 46, and Special Operations Officer. From August, 2008 to September 2010 Captain Thomas was assigned as Commodore, Submarine Squadron SIX in Norfolk, Virginia. In October, 2010 he assumed duty as Chief of Staff, Carrier Strike Group TEN. Captain Thomas is entitled to wear the Legion of Merit Medal with one gold star, Defense Meritorious Service Medal, Navy Meritorious Service Medal with one gold star, the Navy Commendation Medal with two gold stars. Official U.S. Navy portrait courtesy of Bill Gonyo. 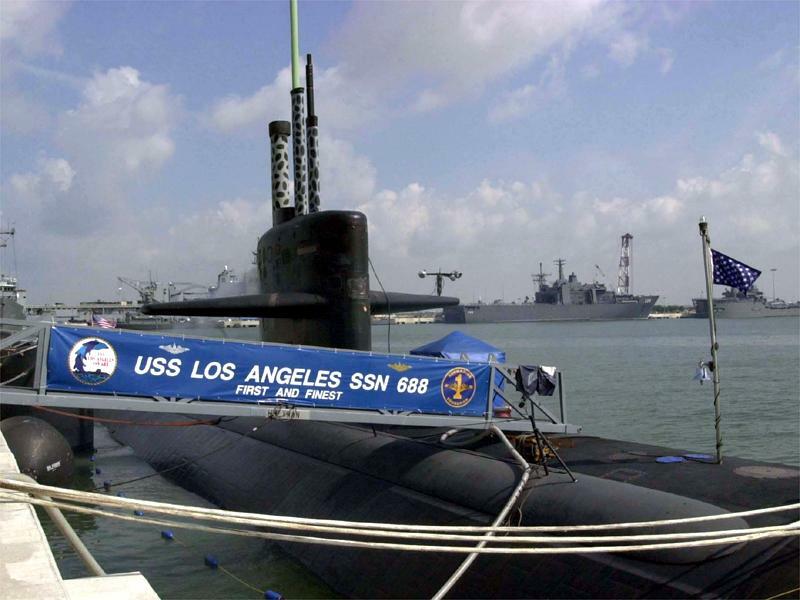 902k Los Angeles (SSN-688) enters Apra Harbor in preparation for a port visit in Guam, 27 July 2001. USN photo by Photographer'sMate 2nd Class Alan D. Monyelle, courtesy of USCINCPAC / news.navy.mil. 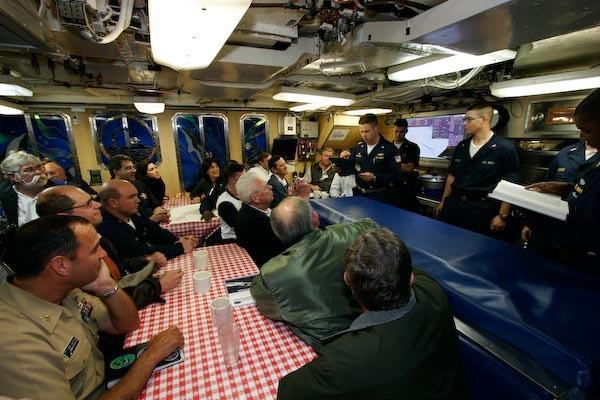 140k Los Angeles (SSN-688) Chief of the Boat explains to the Druid Hills Naval Junior Reserve Officers Training (NJROTC) Corps how a submarine submerges. The NJROTC group toured Los Angeles on 8 April 2004. USN photo and caption by JO3 Corwin Colbert, courtesy of csp.navy.mil., submitted by Bill Gonyo. 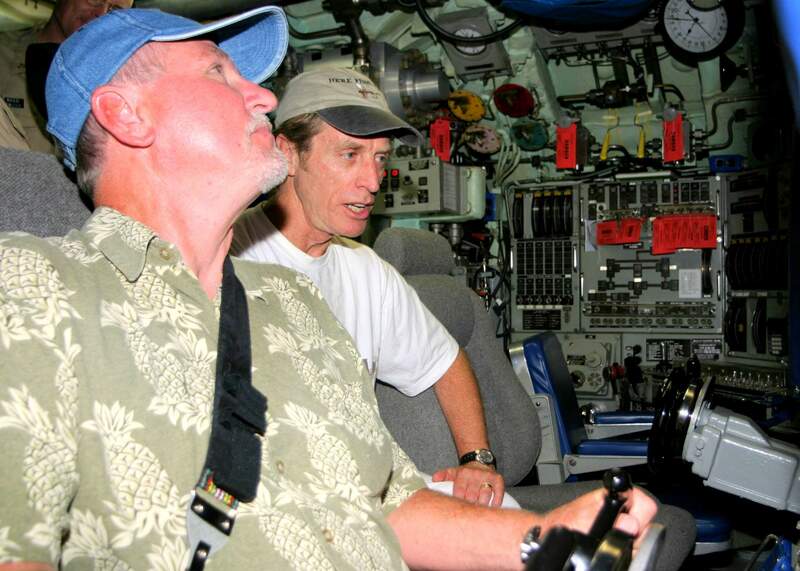 294k Journey bassist Ross Valory (right) and his brother Lance, examine the control panel aboard Los Angeles (SSN-688). The two visited the nuclear-attack submarine on 22 October 2004. USN photo by Journalist 3rd Class Corwin Colbert, courtesy of news.navy.mil. 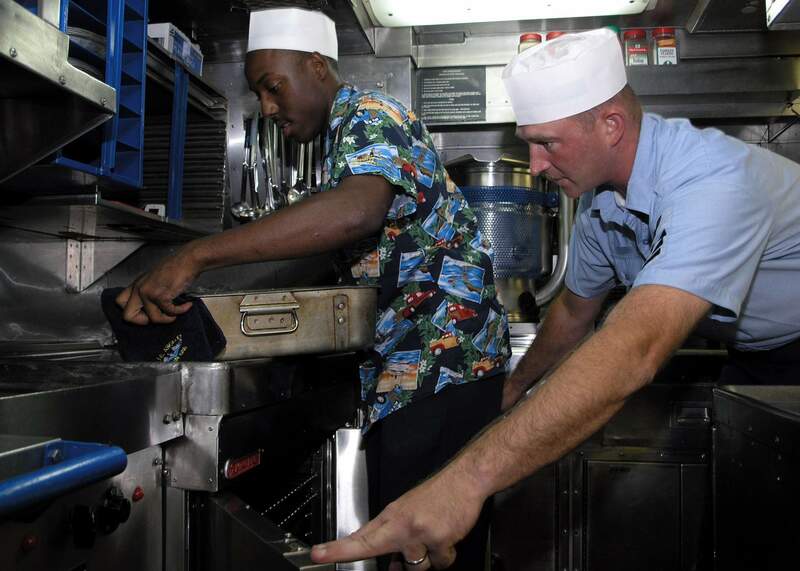 282k A Culinary Specialist 3rd Class from Los Angeles (SSN-688) (left) gets assistance loading food into the new convection oven from Culinary Specialist 1st Class Charles Polen aboard Los Angeles. 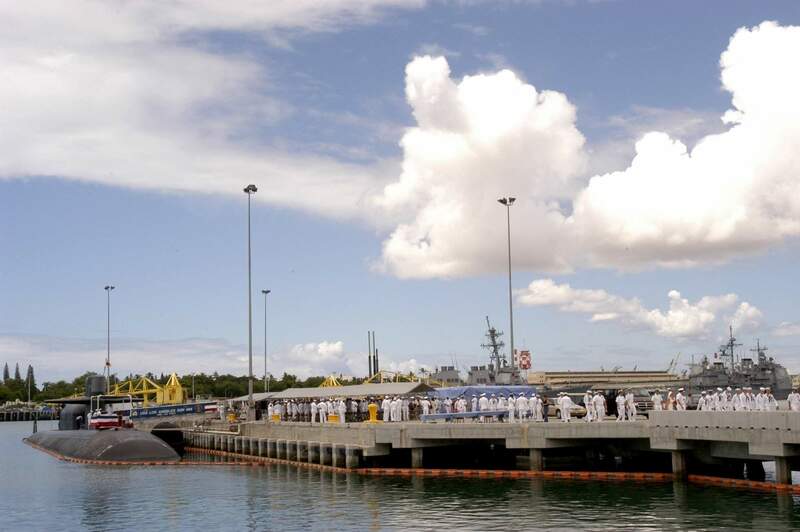 Homeported in Pearl Harbor, the attack submarine is the first in the Pacific Fleet to install and use the new oven. USN photo by JOC(SW/AW) David Rush, courtesy of news.navy.mil. 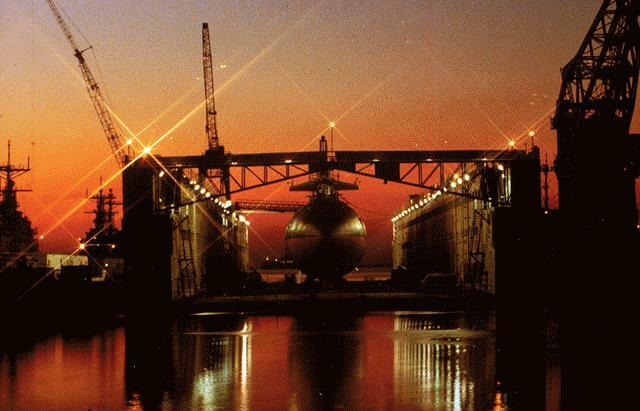 1.10k Buoyancy Assistance Modules (BAMS) were used to float 637 & 688 class submarines into dry dock #4 at the yard. Dock 4 is the smallest dry dock at Mare Island. These BAMS are now used at Pearl Harbor for the same purpose. 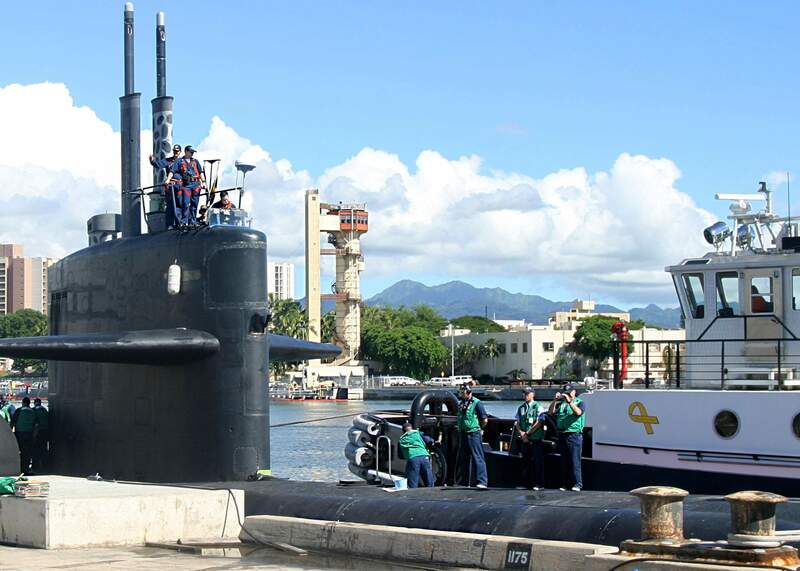 Photo of the Los Angeles (SSN-688) at Pearl Harbor in 2005. One BAM is visible aft of her sail. She is in Dry Dock #3 at Pearl Harbor. USN photo courtesy of Darryl L. Baker. 275k The Los Angeles (SSN-688) is moored at the Southeast Alaska Acoustic Measurement Facility Static Site in Ketchikan, Ak., Thursday, 3 November as part of Escape Exercise 2006. 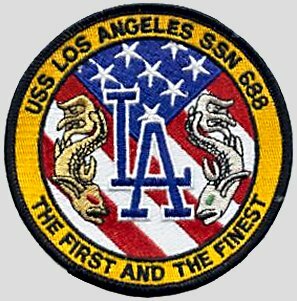 "First and Finest," Los Angeles was the first nuclear powered U.S. submarine to conduct an open ocean escape. A total of seven personnel practiced locking out from the attack submarine Los Angeles and ascending to the surface wearing special suits that designed to enable a free ascent from a stricken submarine. 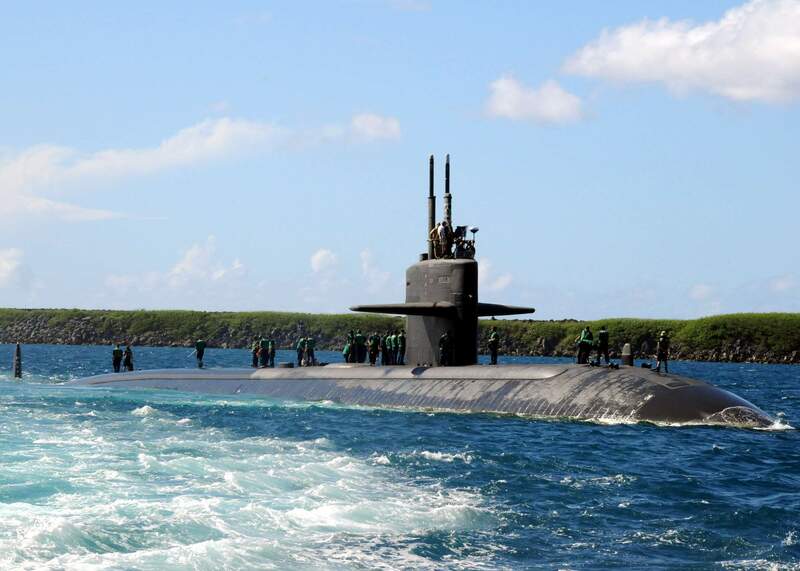 The Navy's renewed interest in submarine escape was brought on in part by the fact that U.S. submarines now operate more frequently in shallow coastal waters, said Submarine Development Squadron Five commander Capt. Butch Howard, who oversaw the exercise. The MK10 Submarine Escape Immersion Equipment, or SEIE, allows survivors to escape a disabled submarine at depths down to 600 feet, at a rate of eight or more men per hour. 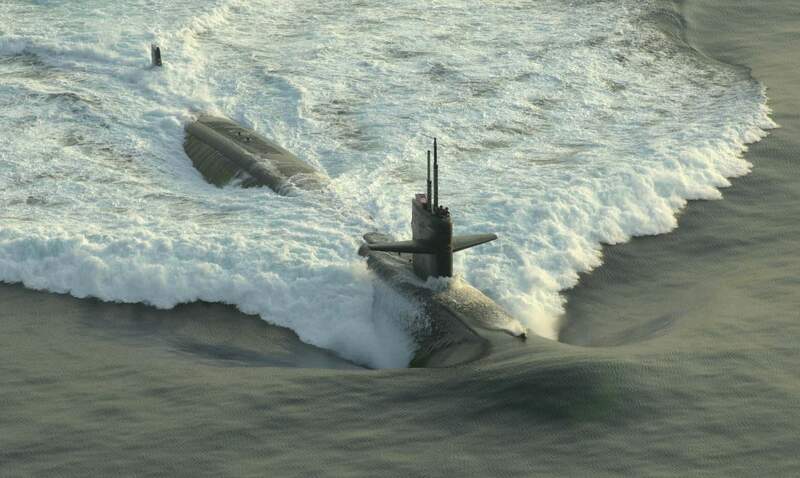 It is designed to enable a free ascent from a stricken submarine and provides protection for the submariner on reaching the surface until rescued. The assembly is comprised of a submarine escape and immersion suit, an inner thermal liner and a gas inflated single seat life raft, all contained in an outer protective stowage compartment. For the exercise, Los Angeles embarked six U.S. Navy divers, as well as a British diver from the Royal Navy. The submarine submerged to 130 feet, where each of the seven divers donned the SEIE suits, entered the escape trunk, and ascended. USN photo # 6113001 by MC1(SW) Cynthia Clark, courtesy of Jack Treutle (of blessed memory). 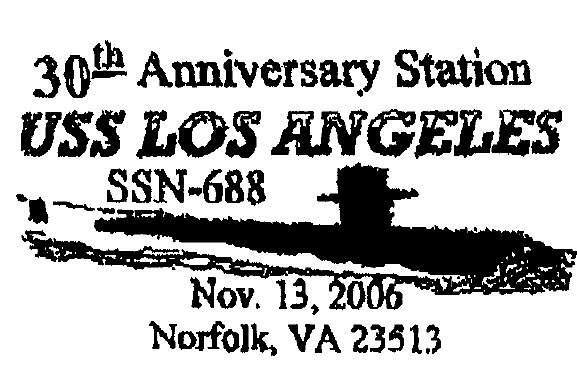 43k Commemorative postal cover issued on the occasion of the 30th year commissioning of the Los Angeles (SSN-688), 13 November 1976 - 13 November 2006. Photo courtesy of Jack Treutle (of blessed memory). 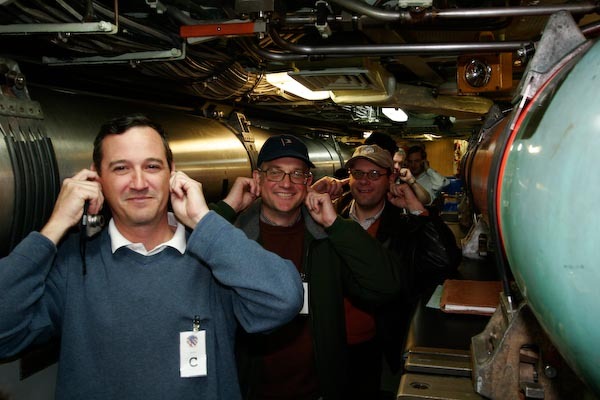 58k Visitors in a tour group hold their ears during simulated torpedo operations aboard Los Angeles (SSN-688). Courtesy of hudsonphotographicarts.com. by Brian Hudson & submitted by Bill Gonyo. 73k Petty Officer Martinez receives his submarine warfare insignia ("dolphins") from Erik A. Burian, Commanding Officer of Los Angeles (SSN-688). Courtesy of hudsonphotographicarts.com. by Brian Hudson & submitted by Bill Gonyo. 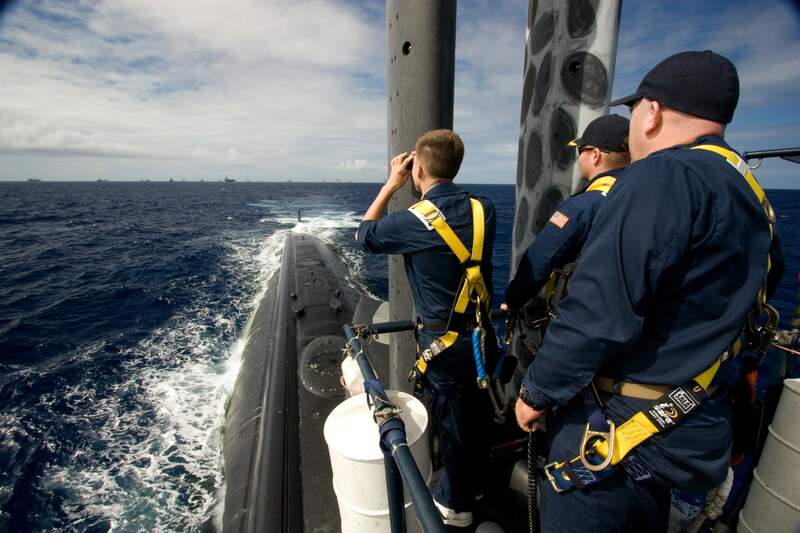 647k Sailors aboard the fast-attack submarine Los Angeles (SSN-688) watch from the bridge as ships from multiple nations gather in a 26-ship formation for a photo exercise during Rim of the Pacific 2008 on 29 July 2008. USN photo # N-8061H-086, by Electrician's Mate 2nd Class Brian J. Hudson. 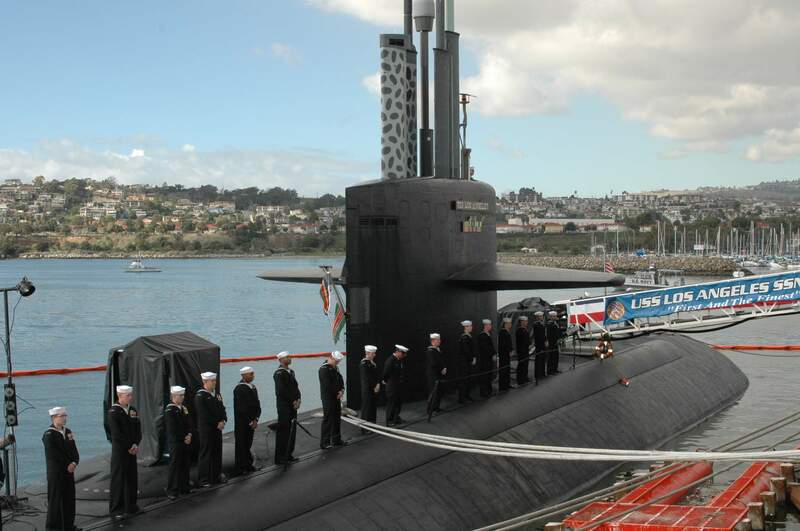 103k CDR Steven M. Harrison assumed command of the nuclear powered submarine Los Angeles (SSN-688) on 22 August 2008. Official U.S. Navy portrait courtesy of Bill Gonyo. 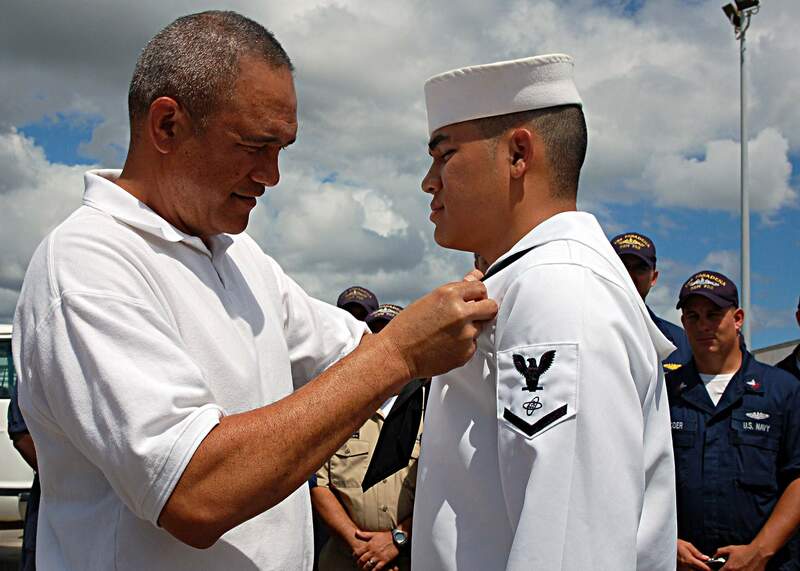 295k Retired Machinist Mate Senior Chief Henry Kanahele, a plank owner of the fast-attack submarine Los Angeles (SSN-688), pins the Submarine Warfare breast insignia on his son, Electronics Technician 3rd Class Nanikamaikaiamekaoluoluokanoho-Lokahipuanaonahoahanau Kanahele during a ceremony at the submarine piers on 5 September 2008. USN photo # N-9486C-001 by Mass Communication Specialist 1st Class Cynthia Clark, courtesy of news.navy.mil. 283k The fast-attack submarine Los Angeles (SSN-688) transits near Apra Harbor, Guam after returning from an underway period on 20th October 2009. Los Angeles, the 4th naval ship to be named after the city of Los Angeles and the lead ship of her class, is on her last deployment. Los Angeles has been operating at sea for 33 years and is scheduled for decommissioning later this year. USN photo # N-1722W-210 by Mass Communication Specialist 3rd Class Trevor Welsh. 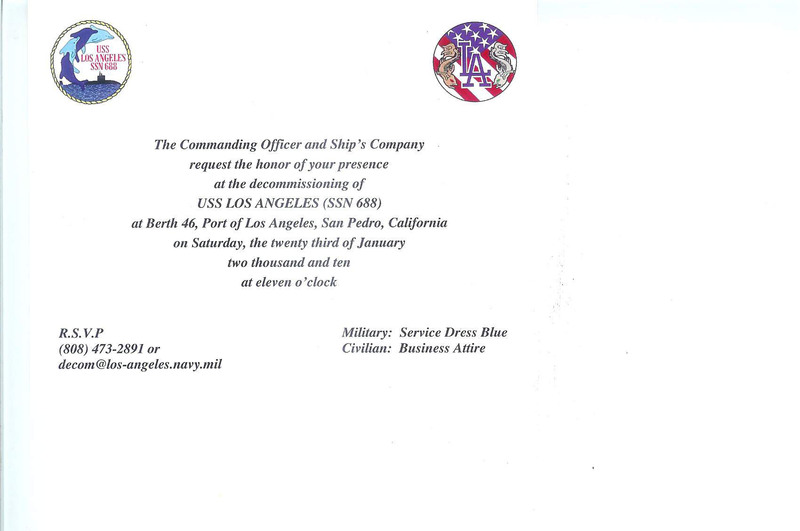 125k Invitation for the Decommissioning ceremony of the Los Angeles (SSN-688). The nuclear-powered attack submarine had been in the fleet for a dozen years, mostly patrolling the Pacific to keep a close watch on Russian subs, when Caleb Schrum was born. On Saturday, Schrum, now 21 and a Navy petty officer second class, gently lowered the American flag on the aft of the Los Angeles at the conclusion of a tradition-rich ceremony in San Pedro in which the submarine was decommissioned from the active fleet. 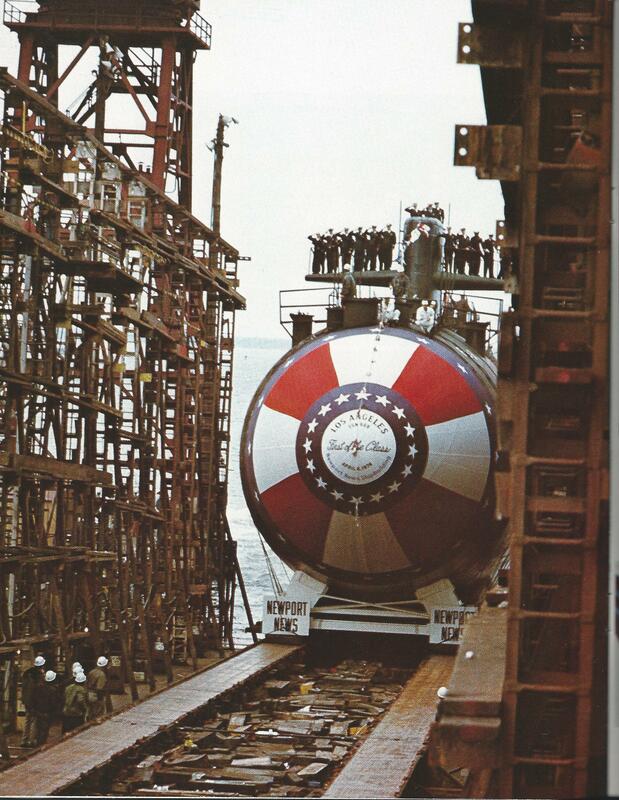 The vessel that entered service in 1976 as the Navy's most innovative underwater warship is headed for retirement as its oldest submarine. Soon the Los Angeles will head for the Puget Sound Naval Shipyard in Washington, where its nuclear reactor will be removed. Under a clear sky at the Port of Los Angeles, several hundred former submariners and invited guests gathered to hear the Los Angeles described as "the first and the finest" and praised for a career that included 18 long-range deployments. 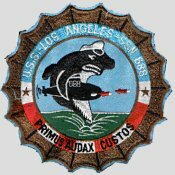 The Los Angeles was the first of a new class of submarines, the Los Angeles class. "I'm going to miss her," said Chuck Wells, 54, who was the submarine's first helmsman, guiding it to depths that, because of the need for secrecy, he can only say were "beyond 400 feet." John Christensen, 74, who served as the first captain of the Los Angeles remembered the sub's speed and agility. "We had an order: 'Rig the ship for high speed,' " he said. "What that meant was 'hang on.' "
True to the submariners' nickname, "the silent service," members were not allowed to talk about their Cold War adventures. "We did things you couldn't tell the civilians about," said Frank Lister, 72, the sub's first top enlisted man. Retired Rear Adm. John F. "Dugan" Shipway, the Los Angeles skipper from 1981 to 1985, said that within minutes of setting sail the first time, he ordered a 30-degree dive as a test. Quickly a report came that a fire had broken out and a forward area was filling with smoke. Shipway, 67, said he immediately figured that he would be removed as captain for having ordered a reckless maneuver. Then came a follow-up report: The smoke was from chicken baking in the galley. "Dugan's career was saved," he said. "Forever after that, we had sliders [sandwiches] for lunch on the first day we set sail." The Los Angeles home port was Pearl Harbor, Hawaii. 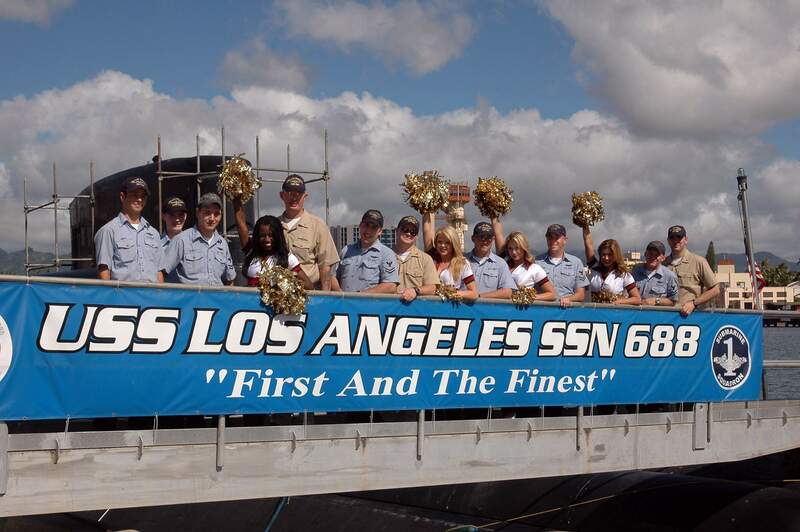 The vessel had been given its name after L.A. officials convinced the Navy of the city's support for the Navy and particularly for the submarine service. 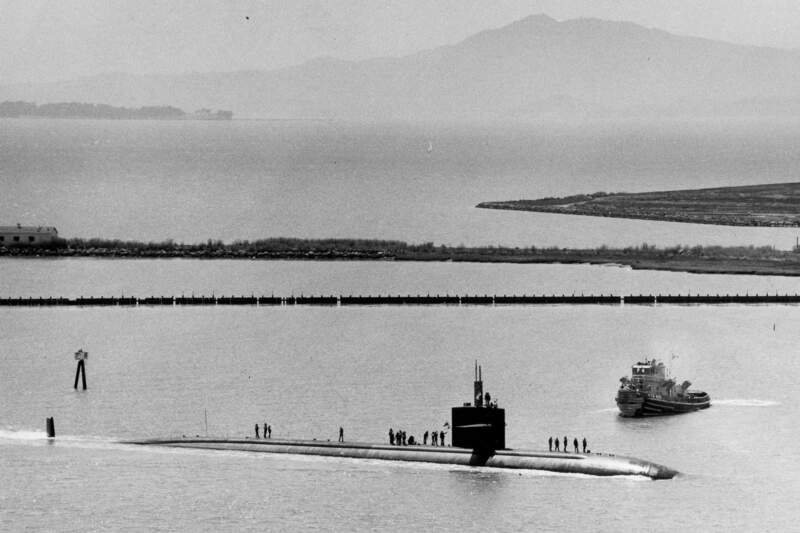 Councilwoman Janice Hahn, whose late father, longtime L.A. County Supervisor Kenneth Hahn, was at the submarine's 1976 commissioning, said she hopes the Los Angeles, in retirement, can return to the port as an attraction. As part of the ceremony, the Los Angeles relinquished a cribbage board used by Medal of Honor recipient Richard O'Kane during World War II. Legend holds that O'Kane did particularly well during a game and that the next day his submarine sank two freighters. By tradition, his cribbage board stays with the oldest submarine in the Pacific fleet for good luck. A rite of passage calls for young officers to play a game with the sub's captain. Lt. Jack Shis, 26, who spent the last three years on the Los Angeles, remembers his first cribbage game. His next assignment is a shore billet in Naples, Italy, but he said he will miss the Los Angeles. "This is a sad day for all of us," he said. "It's been a good experience, but all good things have to come to an end." Text by Tony Perry courtesy of latimes.com & submitted by Ron Reeves (of blessed memory). Photo submitted by Ron Reeves (of blessed memory). 286k Sailors assigned to the fast-attack submarine Los Angeles (SSN-688) man the rails one last time during the boat's decommissioning ceremony at the Port of Los Angeles on 23 January 2010. Los Angeles will transit to Puget Sound Naval Shipyard in Bremerton, Wash. to begin the inactivation process. USN photo # N-4540W-071, by Chief Mass Communication Specialist Jeffrey Wells. Courtesy of the US Navy Chinfo Ship Images. 429k The end of an era. 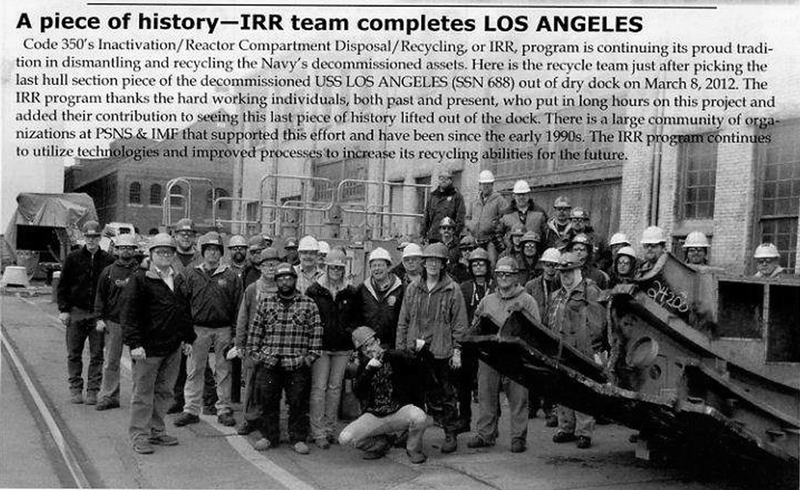 The IRR teams finishes off the Los Angeles (SSN-688) on 8 March 2012. USN photo submitted by Gary Priolo & Ron Reeves (of blessed memory). Cover by Tom Armstrong.